Quran Mobile is first of its kind mobile phone in India - exclusively offered by eBusiness Indya . This unique and feature rich Islamic mobile phone was just launched in India. 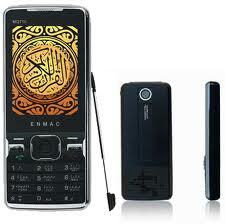 The great looking handset is already very popular among the muslim community in other parts of the world. The phone not only boasts about its Islam centric features but also sports a beautiful look and brings along a rich set of multimedia capabilities. Synchronised Quran text and translation with recitation audio.